WP Fusion includes a logging tool, which you can enable from the Advanced tab of the options page. When enabled, you’ll see a new tab appear in the options page with a link to the activity logs. Note: The logs are a helpful diagnostic tool, but if you have a high traffic site and leave the logs on for an extended time, they may grow to 1000’s of pages long and become hard to navigate. If you are going to leave the logging on, we recommend either checking “Only log errors”, or periodically purging the logs by pressing the Flush Logs button. 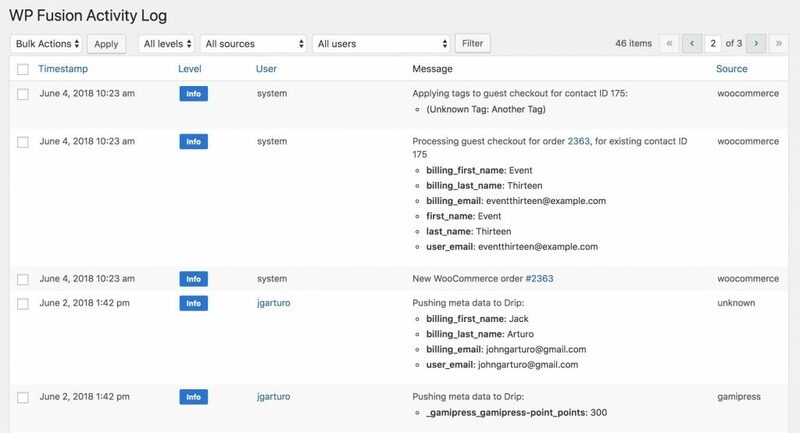 The activity log will record any API calls sent by WP Fusion, as well as any webhooks received and auto-enrollments that are triggered. You can filter the log entries by severity level, source (plugin integration), and related user by using the dropdown at the top. The logs will also record any API errors encountered. 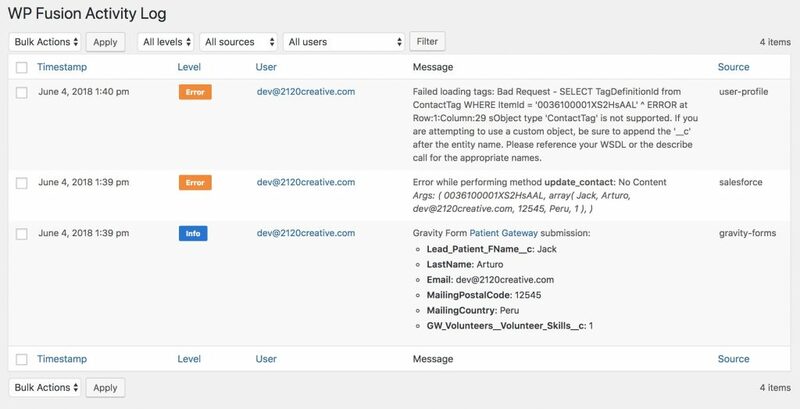 These will vary depending on your connected CRM, but can be caused by several things— like trying to apply a tag that’s been deleted, API quotas exceeded, or malformed data. If you encounter an error in the logs that you don’t understand, please contact our support team so we can resolve the issue for you.